The 2.4-liter engine called 2AZ belongs to the AZ-series released in 2000. The 2AZ engine is the oldest brother of the 1AZ. The 2AZ was designed to replace the old 5s engine. As mention before, the 2AZ is based on 1AZ components. The cylinder block is aluminum with sleeves. The cylinder bore was increased to 88.5 mm what lead to using bigger pistons compare to 1AZ pistons. For vibration reduction, there are two balancer shafts inside the crankcase. The engine has aluminum DOHC 16-valve cylinder head with variable valve timing system VVTi on the intake camshaft only. The 2AZ uses a timing chain to rotate camshafts. There are no hydraulic lifters. The adjustment of valve clearance is required every 60,000 miles (100,000 km). These two engines are almost identical expect the displacement. In 2008 the engine was redeveloped. This 2008+ engine makes more power and torque. The compression ratio rose to 9.8 from 9.6. The engine got new more performance camshafts rising red line to 6500 rpm, oil squirters for cooling pistons spraying oil on the bottom side of pistons. Output is different: 161 hp (120 kW) in the Scion tC, 177 hp (132 kW) in the Rav4, and 158 hp (118 kW) in the Camry, Corolla XRS, and Scion xB. In this year Toyota also released the new engine 2AR supposed to replace the 2AZ-FE (but it is still produced for some countries in our days). 1. This engine consumes oil in significant capacity due to wrong piston rings design for North America Toyota models. The issue usually starts after 45-50k miles. 2. The widespread problem is what cylinder head bolt threads wear out on the back three middle bolts. This problem can be identified by leakage of coolant from the rear end of the engine and an overheating. The manufacturer solved this problem by the new design of cylinder block in 2007. 3. The cylinder block is not rebuildable. If it is damaged, you have to replace it with new or used in good condition. Some problems are identical to the 1AZ, which is not surprising, considering the fact that they are almost the same. Without issues listed at the top, the engine is quite reliable and can run up to 180-200k miles. 2AZ-FSE. Version with direct fuel injection system Toyota D4. The engine has high compression ratio - 11.0:1. The 2AZ-FSE produces 161 hp (120 kW) at 5800 rpm and 170 lb ft (231 N m) of torque at 3800 rpm. 2AZ-FXE. This 2.4 liter version works by Atkinson cycle. It shares the same bore and stroke but camshafts and pistons were made special for this engine. 2AZ-FXE were designed for hybrid vehicles: Toyota Camry Hybrid AHV40, Lexus HS 250h, Estima Hybrid. 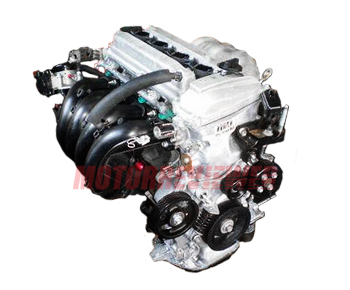 The engine is rated at 147 hp (108 kW) at 6000 rpm with 138 lb ft (187 N m) of torque at 4400 rpm.